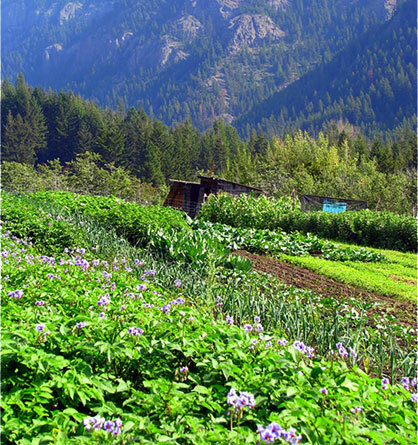 Sointula Greens Mountain Farm Retreat is situated just 3-1/2 hours north of Vancouver, B.C. 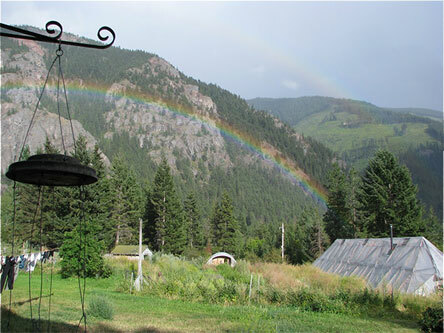 Located in the beautiful Fraser Canyon, this rustic 70-acre organic farm has year-round access for harried citydwellers needing to “get away from it all.” Choose your perfect vacation: farm chores, meditative mountain walks, hiking, star-gazing, trail-riding, river-rafting or spiritual retreat. There’s something for everyone. 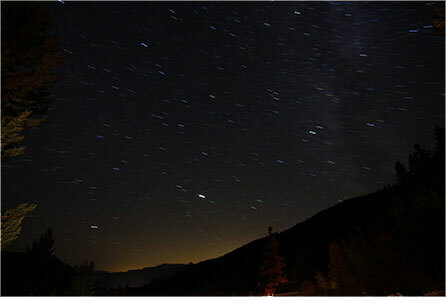 Enjoy clean mountain air, incredible night skies, breathtaking scenery. 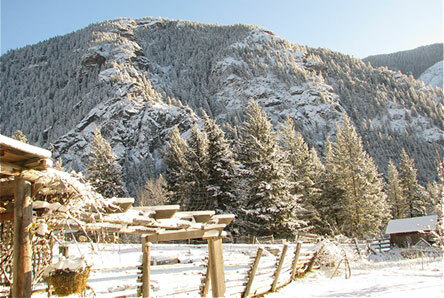 Interested in a working farm vacation, quiet spiritual retreat or adventure-laden mountain holiday? We’ve got it all!! Imagine leaving behind the heat, the noise and the rushed pace of the city for a quiet mountain farm retreat. After driving through the desert temperatures of Lytton, B.C., you appreciate the cooling air as you ascend into the Botanic Valley. Leaving behind dry sage brush and scorched earth, you climb first into scented pine forest and then into the tranquil beauty of lush fir. Beyond Sointula Greens, as the road continues to climb and the valley narrows, the forest changes to spruce, hemlock, and balsam. A few kilometers from town, you cross into Native Indian land. Before you now stretches a Monet landscape, a glorious panorama of red, yellow and purple alpine flowers. Your first peek at Sointula Greens is framed through old, abandoned farm machinery. A dog will likely saunter out to meet you, tail wagging in welcome. Soon the quaint cabins of Sointula Greens come into view. As you park your car under the tall firs, you look south down the valley. Through the shining clean air, you can see the majestic Coastal Range in the west and the Washington Cascades in the east. With a deep sigh of pleasure, you bring your glance back and take in the rustic cabins, treed acres and natural pastures of Sointula Greens. 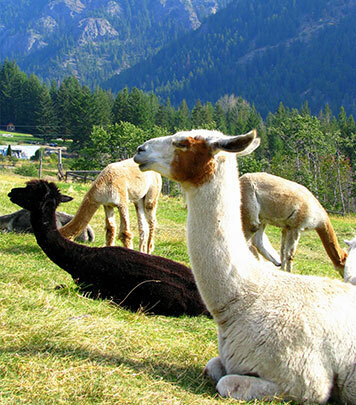 Alpaca graze in front of the cabins. Not far away, a Maremma Sheepdog watches over the animals. Already your heart feels light, your spirit free and your mind calm and clear. The Hobbit House nestled among the tall trees is yours for a few nights. Tomorrow you might meditate quietly in the alpine meadow or celebrate your freedom by going on a gentle hike. You might lend a welcomed hand with farm chores or gardening. You might even go on a wild river rafting tour. Whatever activity you choose, it’s far, far from the stresses of your everyday life. 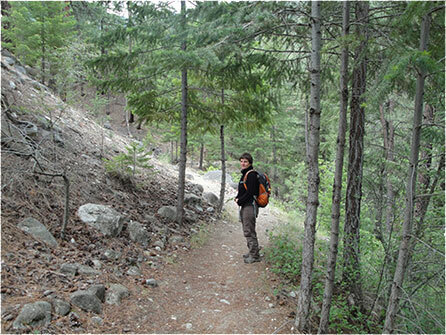 In summer, high above the heat and desert conditions of Lytton, B.C. temperatures in this mountain valley are noticeably cooler during the day and comfortably cooler in the evening. As we gather around the fire pit, you may need that extra sweater you packed. 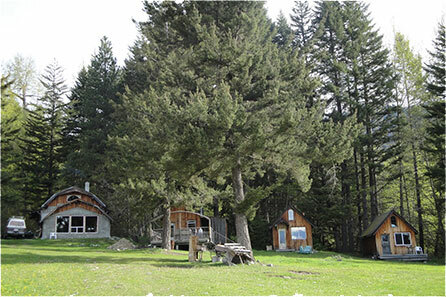 Directly behind the cabins of Sointula Greens flows Baldhill Creek. In spring, summer, and fall this is a lovely babbling brook; in winter its surface is frozen solid. The stream produces an abundance of negatively charged ion particles. This invigorating atmosphere, together with the fir and cedar woods behind the cabins, creates a fragrant, calming yet revitalizing setting. During the day, many visitors enjoy peaceful meditation. At night, this refreshing environment encourages a deep sleep accompanied by pleasant dreams. What’s your favourite holiday season? Plan now to spend it at Sointula Greens. Call us today! 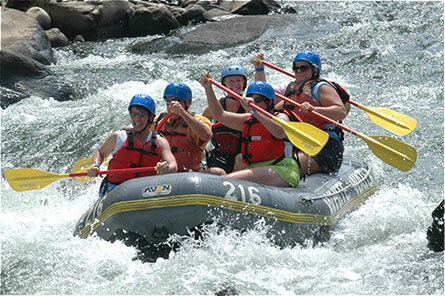 Experience the excitement of river rafting! Nearby Lytton, B.C. is known as the Rafting Capital of Canada. Please arrange your excursion directly with our local raftingcompanies. 1/2-day to 3-day trips (demand is strong so make reservationswell ahead of time). Make arrangements at time of reservation with Sointula Greens. 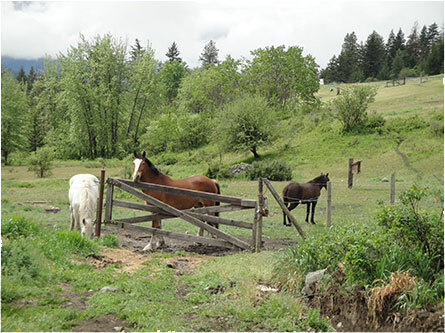 3-hour guided tour in the riotous beauty of our alpine meadows. Led by a local Native Indian guide. Learn to develop and feel your own spiritual energy. Transfer your spiritual energy first to the plants and then to Mother Earth herself. 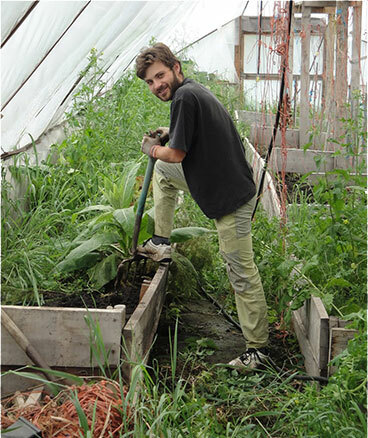 Roll up your sleeves, lend a hand, and learn all about smallhold farming. We don’t charge a penny for this activity, either! Please arrange your excursion directly with our local rafting companies. 1/2-day to 3-day trips (demand is strong so make reservations well ahead of time). Hike the famous Stein Valley or the beautiful mountains directly around us. Go at your own pace. There’s no rush, no deadlines, no goals to meet. Take a lunch and stay all day or just go for a healthy walk. Watch the stars! Sointula Greens is located in the Botanie Valley where the air is crystal clear and the night sky is awesome to behold. You never see the stars as starkly beautiful as this in any city in the world. 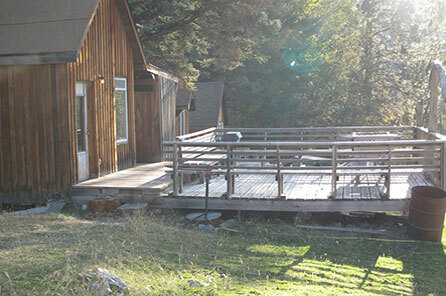 The three cabins which provide a spectacular view can accommodate group meetings of up to twenty-two people with campsites available as well. The Hobbit House by itself, or in configuration with the other two cabins, is well suited for accommodating individuals, couples, families, group gatherings, retreats and seminars. The Hobbit House sleeps ten people. 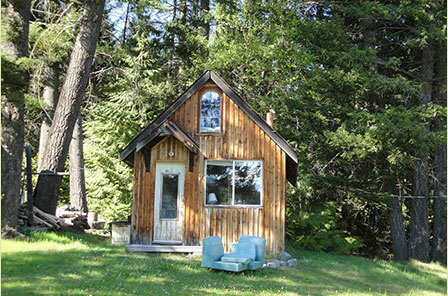 The other two cabins sleep six people each. For larger groups, campsites are also available. You and your family or group can experience scenery, solitude, peace...or rousing mountain adventure! Choose the vacation that suits you best... Call us today! 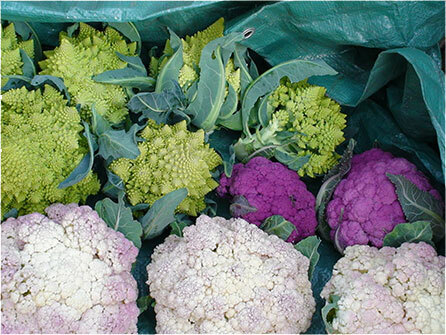 We’re opened from spring till fall!